This entry was posted on Monday, March 12th, 2012 at 9:00 am and is filed under Comics. You can follow any responses to this entry through the RSS 2.0 feed. You can skip to the end and leave a response. Pinging is currently not allowed. Hope no copyright implications re name of restaurant and ye olde board game. Dr. Mick Douglass then went home to see his darling son, who was tragically born part stick-insect. Love the *Garth Marenghi* homage , does this mean Faraday is really Skipper the Eye-Child ? Mick - I think this constitutes ‘fair use’. Free advertising if nothing else! Broto - Does he stop to wax philosophical with his best buddy, Luciano Sunshades? This is so disturbingly awesome!! Love that last panel. 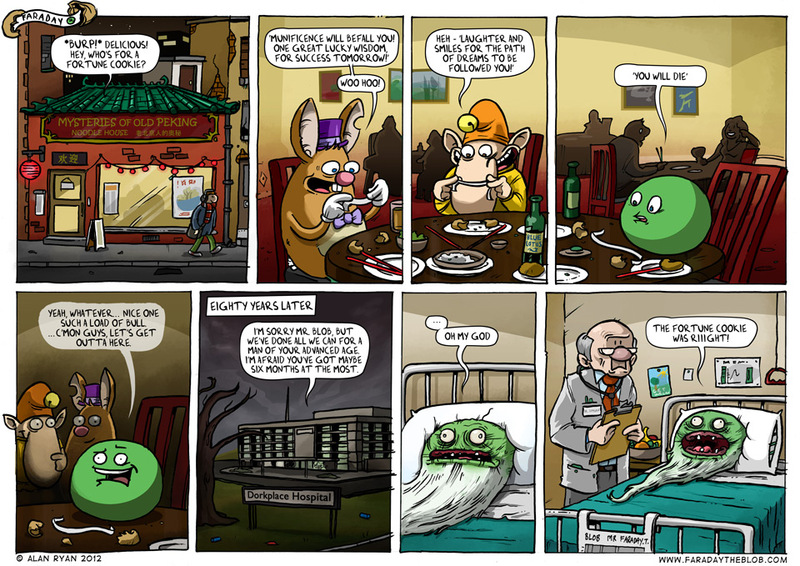 The homage to Darkplace Hospital is awesome (as is the rest of this comic).